Gilles Pelletier's interest in collecting and restoring antiques led him to begin to paint on the objects he was restoring. His colourful paintings adorned antique furniture, old tools, and even milk cans. 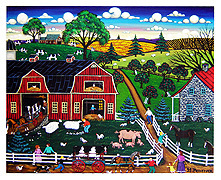 He later started to create wooden animals (ducks, horses, pigs and cows), and to paint directly on barn wood and on canvas. Drawing upon his own experiences and observations as well as stories told to him in childhood, Pelletier fills each of his paintings with detailed scenes from everyday life. His paintings evoke memories of times past. 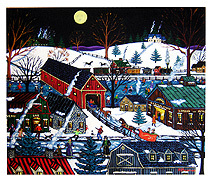 Gilles Pelletier illustrated several children's books and the Toronto Hospital for Sick Children commissioned Pelletier’s work which was used for 45,000 cards in a highly successful fundraising campaign. Ref: Roch Carrier. Montreal: Tundra Books, A Happy New Year's Day (1991); Jonathan London. 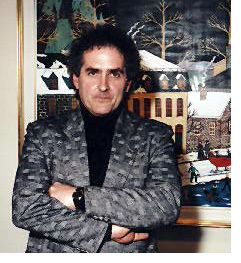 Toronto: Lester Publishing, The Sugaring-off Party (1995); Library and Archives Canada.